Home - Angler Marine, Inc. Welcome to Angler Marine, Inc.
ANGLER MARINE, INC. is a full service marine repair business located at 417 Ed Hembree Drive in Scottsboro, Alabama in the heart of the beautiful Tennessee Valley. Our facility is located ¼ mile off the Tennessee River on Lake Guntersville at mile marker 378.2 (GPS coordinates N-34.34.801, W-86.04.765). Look for the GOOSE POND COLONY MARINA sign. With our 50 ton Marine Travelift and launch piers, we can accommodate the hauling, underwater repairs, and maintenance of larger cruisers, yachts, and houseboats. We are pleased to provide this much needed service. Service is our business. 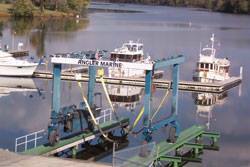 ANGLER MARINE INC. is unique to the Tennessee Valley. 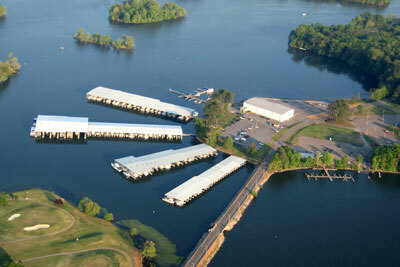 We do not run or own the marina; we lease the shop at Goosepond Marina. This gives our customers a distinct advantage because this lets you know that we are 100% focused on repairing and maintaining your boat. We are not distracted from our work by the need to attend to business in other areas of the marina. Our focus is on you and your boat, and our top priority is giving our customers the best service in the Tennessee Valley. ANGLER MARINE is the only certified MERCRUISER repair facility located on the river in the area. We are also a Mercury outboard repair facility. In addition to being a Mercury and Mercruiser repair facility, we also work on Johnson, Evinrude, Yamaha, OMC, Volvo Penta, Crusader, and other marine engines. Boat engine repair and maintenance is not our only area of expertise. We also specialize in bottom paint and repair, fiberglass repair, and gelcoat repair. Convenience is our priority. ANGLER MARINE maintains a large inventory of quality boat parts and accessories for most models to help ensure that everything you need is available for a pleasant boating experience for you and your family. We also have access to helpful vendors that guarantee next day delivery for most boat and engine parts not in our extensive inventory. We are open Tuesday through Friday from 7:30 a.m. to 5:00 p.m. and 8:00 a.m. to 12:00 p.m. on Saturday. Our customers always come first. Our qualified and friendly staff is standing by to make sure your boating time is safe, enjoyable, and trouble free. So come by and experience the quality service and genuine appreciation that ANGLER MARINE has to offer.